This book is a revised edition of Desi Serna’s original 2001 release, How to Make Money Teaching Guitar, which was one of the very first coaching materials on the market geared toward guitar teachers. 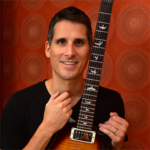 Through a step-by-step process, and using a positive and encouraging tone, Desi and his new coauthor, Donnie Schexnayder, guide you through the ins and outs of teaching and illuminate the professional and personal benefits that guitar instruction can offer you. 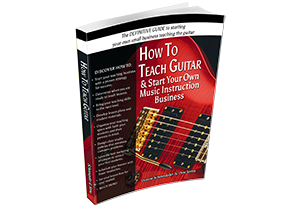 How To Teach Guitar and Start Your Own Music Instruction Business is the definitive guide to starting your own small business teaching the guitar. Start your teaching business with a proven strategy for success. Determine when you are ready to teach lessons. Bring your teaching skills to the next level. Develop lesson plans and student materials. Organize your teaching space with both your students and their parents in mind. Design clear studio policies that minimize common problems. Learn the best marketing strategies to attract your first students. Schedule your lessons with fewer headaches. Set your lesson fees for your market. You may have any number of reasons for wanting to teach the guitar. Maybe you want to earn some extra money in your spare time. Perhaps you want to use your skills as a musician to help others. Maybe you see teaching as a way to round out your career as a musician. Whatever your reasons, this book can be your passport to a whole new experience with music and your work. Improve your own guitar skills. Earn money while doing something you love. Control how much money you earn. Make a difference in other people’s lives. Boost your success as a gigging musician. Specialize in a field that doesn’t need formal training or a college degree. Start your own business with very little up-front money. Donnie Schexnayder and Desi Serna have written this book to take you from the beginning, from never having taught guitar before, to your first ten paying guitar students. The 90-day action plan takes you one step at a time towards establishing your new teaching studio. It has never been easier to start teaching the guitar! Within a week of being released, the new book came under a coordinated attack by some negative Amazon reviewers. Here are responses to the most common points they make in those negative reviews.